For nearly 100 years, Restaurant Hospitality (RH) has served the information needs of the independent restaurateur. 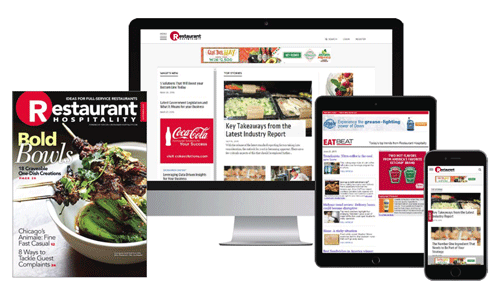 The editorial team is on the pulse of the industry, creating content that connects deeply with this professional audience with new ideas for restaurateurs to refine, enhance and build their business. This content drives the most highly trafficked website targeted at the independent market, as well as the popular Eat Beat eNewsletter. Restaurant Hospitality offers the largest and most valuable audience of independent restaurateurs in foodservice. This provides both widespread scale and also a critical mass for targeted programs. RH specializes in targeted programs to help you reach readers engaging with specific topics such as food trends, technology, equipment, and more. RH also delivers the most ways to reach this audience, whether it be through the magazine, website, eNewsletters, custom eBlasts, mobile or live events. From tactical lead generation and product announcements to broad, strategic brand building and through leadership, more advertisers turn to RH to help deliver their marketing message.